DescriptionA lovely chalkboard hanging wedding sign. Can be used throughout the day, at the ceremony, wedding breakfast and reception. 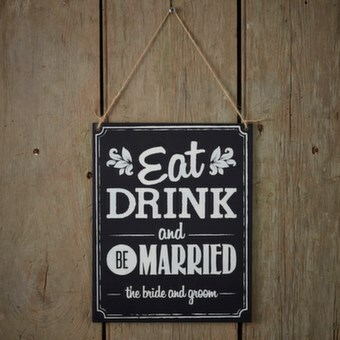 "Eat, drink and be married" perfect saying for the big day! Sign measures 20cm W. String is attached so can be hung. A lovely chalkboard hanging wedding sign. Can be used throughout the day, at the ceremony, wedding breakfast and reception. "Eat, drink and be married" perfect saying for the big day! Sign measures 20cm W. String is attached so can be hung.